In her late twenties, Cait Flanders found herself stuck in the consumerism cycle that grips so many of us: earn more, buy more, want more, rinse, repeat. Even after she worked her way out of nearly $30,000 of consumer debt, her old habits took hold again. When she realized that nothing she was doing or buying was making her happy-only keeping her from meeting her goals-she decided to set herself a challenge: she would not shop for an entire year. 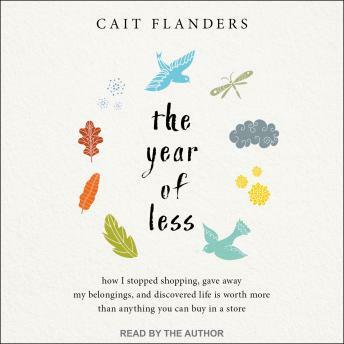 Blending Cait's compelling story with inspiring insight and practical guidance, The Year of Less will leave you questioning what you're holding on to in your own life-and, quite possibly, lead you to find your own path of less. Just finished this thought provoking book....my way of thinking has already changed! For example, I enjoy doing needlepoint...working on a project now...was thinking I need to stop by needlepoint shop to get a particular color...I have two deep drawers of unused yarns! I have decided to change the color design and incorporate colors I already have....baby steps.....thank you, Cait!